No one Is pissed off. John's PDF explains in detail how my ratios are setup on my machine, but you have to understand, I work in inches, not metric, so there may be a lack on my part to be able to explain the ratios to you better then I have. My mistake, I went back and looked at my manual and it says to set the steps to 640 for metric on Z and for inches I had to set it for 16256 steps. Maybe Paul can explain the ratios better how to get the 256 incremental steps you need then I can as he works in metric values. First, consider a grayscale image, where each pixel is represented by a one byte value between 00 (black) and hexadecimal FF (white). There are 256 possible values for each byte, and that equates to the number of steps for the motor to take. You want those 256 steps to move the encoder shaft 1 full turn. On my setup, I have a hobbycnc motor control board driving 1.8 degree steppers. It is capable of microstepping at 1/2, 1/4, 1/8, or 1/16 step, and mine is set to 1/2 step microstepping, so I need mach3 to move 400 steps for one complete motor shaft revolution. The motor/encoder pulley ratio is 3 to 1, so 1/3 of a motor revolution moves the encoder all the way around so its output varies between 0 volts and 5 volts. With a voltmeter on the encoder, I single step jog down from 0 volts until the meter reads 5 volts, and record the 'depth' from mach3's DRO. That becomes the max depth I use on the picengrave menu. Easier with the counter/DAC circuit or Jeff's digital potentiometer circuit - I set the steps per inch in mach3 to 10,000 or 0.0001 inch per step for the axis that feeds the circuit. A full count of 256 (hex FF) becomes a 'depth' of 0.0256 inches on the mach3 DRO and in picengrave's menu. Now I think I've burned out my last brain cell. encoder shaft 1 full turn. depth I use on the picengrave menu. I've burned out my last brain cell. this is very well explained, i didn't know the stepper board could really and truly output 1/16 of a step. i hope you still have few brain cells left!! that's all ... so i need to find a better stepper driver chip or make the DAC circuit. thank you again everyone ! and thaks to you all! still waiting for the driver from denmark but i think there is still few days to wait cause "badpip2010" as still some exams. Unfortunately ruined by 3W 808nm laser. Now I can not experiment with for a while. But it to monitor the laser topic. Sorry to hear that Zoli - if it's any consolation, you are not the first and I am sure will not be the last to do that. Tweakie is right, but I know that it doesn't make it any easier to accept. Who said our hobbies were inexpensive? I still waiting for my replacement diode - hopefully today the mailman will find my address. sorry to hear that as well!! did you do something special to burn it? Sorry to here that Zoli. Is there a 445nm in the near future? Unsure TTL level was the cause. The laser diode can not handle a few KHz vibration. I want to buy 2-3W 445nm laser diode. But we need at least two months. Fan, heatsink, diode + lens/housing, power supply for it, PWM/POT setup. Is that about it? Ask Dave. He may sell you his turnkey one at a reasonable price. Considering it may help him recover some of his cost with his new CO2 toy. I think I'll hold on to the diode laser for a while, Jeff. So what sort of Diode setup do you run Jeff? I'm just trying to get a bead on how much it would cost to consider that sort of 'expansion' for myself. I see diodes varying in power and price and wavelengths from $40-$170 for just a diode. here is a PDF of some laser diode component info that John had posted earlier in this thread. Here is the laser diode I would recommend. It has ESD protection and will land in the 2-2.5W range with the 3 element glass lens. My current engraving system is only 1W that is in the pdf and the one I used for the engravings I posted in this thread. That diode looks like a good choice to me, much better output than the 1.7 watts that mine has. I think the 445nm lasers here http://visiblediodelasers.com/ look like the one that Jeff and I started with. I don't see his stuff on ebay, but I've always had trouble searching for stuff there. Here is what he offers on ebay now. It's pricey. Both me and Dave gutted ours and installed in different enclosures. I'm sure he will agree, what we know now, we would have just build our own from scratch allot cheaper. The hardest thing to find right now is an appropriate 0-5V analog modulated driver for these laser diodes. Both me and Dave have the Flexmod P3 which has been out of stock for quite some time now. 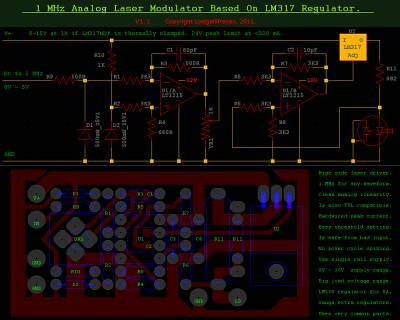 For anyone that would like to build there own 0-5V analog modulated laser diode driver, here is a schematic of a circuit I found on the web. The LM317 can be changed to a LM338 for up to 5A output. thank's for the schematic Jeff. now i'm kind of desparate to recieve my laser driver from Badip2010 but still no news from him (i sent 4 mails). i guess i'll have to be more patient...or build the board Jeff pointed out.